A Flying Tender 5.5 will be delivered to a Mediterranean port between Cannes and Monaco, on 15 May 2019. On show in a five passenger configuration, the demo RIB should be of interest not only to high end customers, but to people working in tourism. What is SEAir’s goal? To provide demanding customers with an opportunity to enjoy a completely new experience and explore the beauty of the south of France, while learning the joys of boating safely and “comfortably”, 20 cm above the waves. 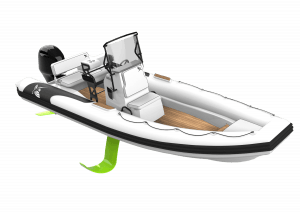 Very much in tune with the times, the Flying Tender 5.5 boasts one of the key features of SEAir’s RIBs, with a considerable reduction of fuel consumption of over 30%. The longer version offers high quality space, while the taxi model can carry up to 6 passengers.